Subterranea is a modification of the Vanilla terrain generator that switches the above and below ground spaces so your world has 192 layers below sea level and 64 layers above. Great for Mole Man worlds. Creates a world mostly underground instead of mostly full of air. All the expected above ground features of the vanilla terrain generator: villages, temples, trees, etc. 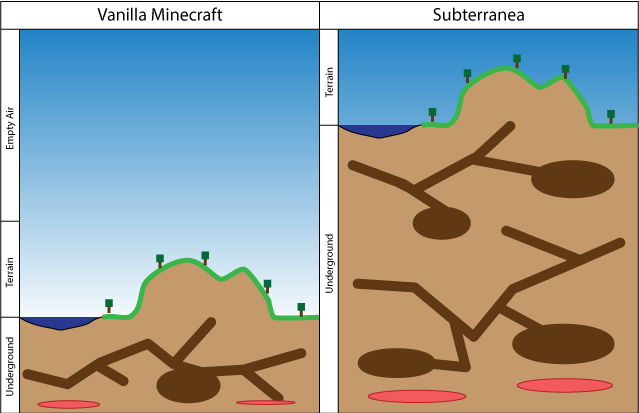 All the expected below ground features of the vanilla terrain generator: caves, ores, lakes, lava, etc. If you use "world" for [worldname] in your bukkit.yml, Subterranea will run in your default world. [:options] can be omitted to use the default settings. See below for details. I highly recommend using a plugin like [World Border](http://dev.bukkit.org/bukkit-plugins/worldborder/) to pre-generate your map. Generating new chunks with Subterranea is very CPU intensive. The Subterranea world generator supports a number of options. Options are passed into the generator using the [:options] string in the above examples. Always put a colon between the word Subterranea and the options string. -silverfish: (true or false, default true) Enables or disables silverfish colony creation hidden in the stone. -giant-caves: (default sxz=500,sy=175,cutoff=65,miny=40,maxy=160) Enables or disables the Giant Caves plugin. An optional configuration string can be passed into this option to configure the Giant Caves generator. See the Giant Caves documentation for a description of each setting and how it affects cave creation. You need to install Giant Caves for this to work! -ore-multiplier: (default 3) Sets how many passes the ore populator should make over each chunk. A value of three keeps about the same or density as vanilla. A value above ten may significantly slow down chunk creation. Subterranea is compatible with Giant Caves. To add Giant Caves to a Subterranea world, just add -giant-caves to the [:options] string. mv create world_name NORMAL -g "Subterranea[:options]"
If you plan on using Subterranea in conjunction with Giant Caves _and_ Multiverse, delete the contents of the Giant Caves config.yml file. such a shame :( it would be really nice if we could use this plugin into 1.9(.4) servers! This means bukkit not dead. Bukkit is not dead ! Sorry my question wasn't clear, I meant for the giant caves plugin being used in conjunction. I'm running subterranea as my default world. I am also using giant caves. I am just unsure if giant caves should have 'onlyuseworldmanagers' to true or false. So does subterranea option including giant caves count as using a worldmanager on it? Set onlyUseWorldManagers if you are using MultiVerse (or equivalent) to create a Subterranea world. Set onlyUseWorldManagers to false if you want Subterranea to be your default world. Sorry if this is clear already, I couldn't deduce it from reading all the documentation 1-2 times..
Should I have 'onlyUseWorldManagers' set to true or false when generating a world with subterranea? Sorry, you can't set the sea level to 128. You can try using islandcraft, but I have no idea what will happen. Subterranea properly resets the world's sea level variable, so it might work as long as the author of islandcraft didn't hard code the sea level into the plugin. Is it possible to set the sea level to 128? Also would this plugin be compatible with a plugin such as islandcraft, that fills most of the world with water at sea level? I really like islandcraft, but would like to have a little more room for caves underneath the ocean floor! Is there a way to change the hieght of the terrain in terranea to allow for the hieght of the trees to be fixed or can you add that in the future if it hasn't already been added? Giant Trees, Giant Caves, and Subterranea will all work together on the same server. The only possible issue is that Giant Trees can be very tall. Subterranea moves the sea level to 192, so some trees may be taller than layer 256. These trees will be clipped. Otherwise, everything should work. Will this also work with your other plugin, GiantTrees, with having Giant caves and Subterranea installed? I need to know if the trees will still spawn naturally and how. You can control the size and shape of the giant caves. See the Subterranea Options section above. How close are caves and huge caverns together? I just made a quick world and they are not as close as I thought they would be. The world was more like 70% rock, 20% cave, 10% above ground. It is a little bit cpu and ram intensive when generating chunks, but as you clearly wrote in the instructions; if you use a plugin to pre gen the map, it is working like a charm. Great work!